Wilgaerden, a tailor-made adult daycare centre in the region of West Friesland in the Netherlands, was continuously struggling to find qualified candidates, which they contributed mainly to the (false!) negative reputation that working in adult daycare has. Is that the case, though? What was the solution that Wilgaerden found for their recurring recruitment challenges? Here is the story of Cynthia Lof, HR consultant at Wilgaerden, who tells the story of how the company managed to build a reputation as an attractive employer and how that helps them to find qualified candidates for their job openings to date. “Everyone in the field is aware of the recurring challenges that recruiters at adult daycare centres have, most of which are based on the false image that the healthcare professionals at these daycare centres are mostly busy doing tedious tasks, while in reality this cannot be further from the truth.”. “At the same time, we do realise…”, Cyntia continues “... that our target audience (the candidates we are looking for) – the professionals working in the field of home daycare – are in high demand, so we needed to find a solution as soon as possible.”. 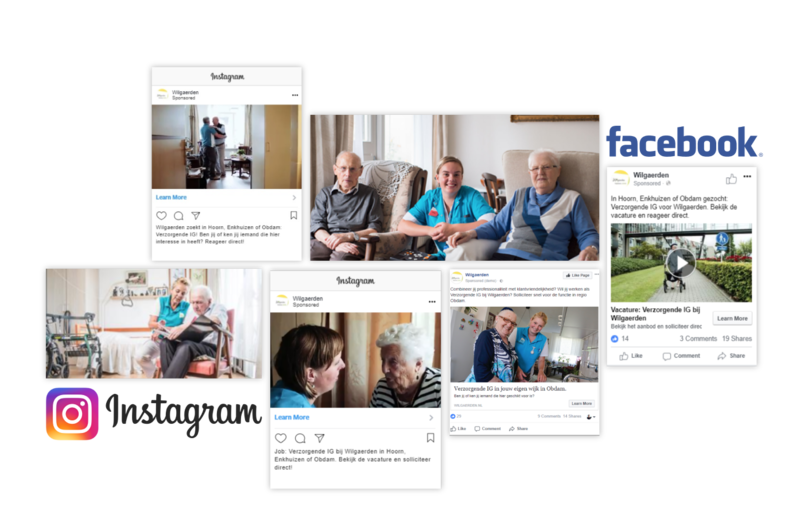 Before approaching VONQ, the recruitment team at Wilgaerden was distributing their vacancies mainly via Facebook, their career site and a few generic job boards. This, however, as Cyntia explains, was not attracting enough qualified candidates. First, Wilgaerden started looking into answering the following: Why has it been so difficult for us to find candidates for certain positions? Are our competitors in the region struggling with the same challenges? What does Wilgaerden stand for?. “We realised that using photos of our employees would help us put a realistic face to the story we want to tell. Next to that, we relied on Google banner targeting and social media channels. Although recruitment marketing was a new concept for us at Wilgaerden, the management quickly embraced the idea with enthusiasm.”. The 3-month job campaign focused on three main regions and was continually optimised: “We were continuously following the progress of the campaign and with the help of VONQ we were able to optimise the campaign on-the-go.”, Cynthia adds. The Outcome: An Increase Of 316% On The Amount Of Applicants Within 3 Months Only! “After a few weeks only, we got the first results. We had already generated enough qualified candidates for one of the target regions and so we decided to revise the campaign’s budget and allocate it accordingly between the other two. As a result, we started noticing immediate positive change for those two regions as well. This approach helped us to greatly optimise our campaign expenditure, which was fantastic!”. “The campaign was also accepted very well internally.”, Cyntia adds. “Everyone liked the fact that we used photos of existing employees and clients for the campaign. We were happy to find out that this approach also helped us to nurture brand ambassadors!”. Besides boosting their employer brand, Wilgaerden also managed to quickly find the candidates they were looking for. It used to take the company a month to recruit 1-2 new hires, and now they managed to hire 19 people in three months only. Cynthia enthusiastically explains: “Within 3 months only we managed to get a 316% increase on the amount of applicants! We also noticed an increase in the quality of the candidates, and so 70% of the candidates who we interviewed were then hired. These results says a lot about the success of our job campaign!”. “We achieved all that by bringing the right story to the right audience at the right time!“, concludes Cyntia. Did you get inspired by the great results that Wilgaerden realised in 3 months only? Are you curious to hear more on how Recruitment Marketing can help you solve your recruitment challenges?